The Perfect compliment for your Weber Kettle! There’s nothing quite like the flavour of meat cooked over lump charcoal. The natural smoky flavours and aromas created by a charcoal fire are something truly special, but charcoal fires can be hard to manage, right? If you’ve used lump charcoal in the past you probably expect to find a bag full of dust and fines among the usable charcoal. Not when you’re using a premium grade charcoal like Weber Red Gum Charcoal. 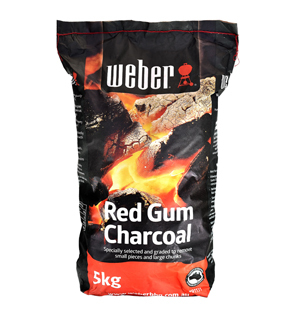 Weber Red Gum Charcoal is made from a sustainable source of 100% natural Australia Red Gum timber. Because we burn our charcoal in rural New South Wales, we know what goes in to every pit, which guarantees the quality of what comes out – premium grade charcoal that is easy to use, lights and burns consistently, and has met Weber’s standards for quality.